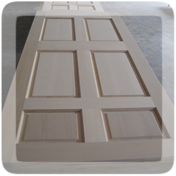 Probyn Export has evolved throughout the years and opened markets for door manufactures. Where we once began a business relationship with a partner by supplying them wood material, Probyn Export will then buy the finished door product back from the manufacturer and resell it throughout the world. This is how manufacturers use the expertise of Probyn Export to open new markets. Are you a door manufacturer looking to buy raw material to make custom doors or are you looking for a North American partner that can export your manufactured doors to the world? Contact Probyn Export to discuss these marketing synergies for your business.